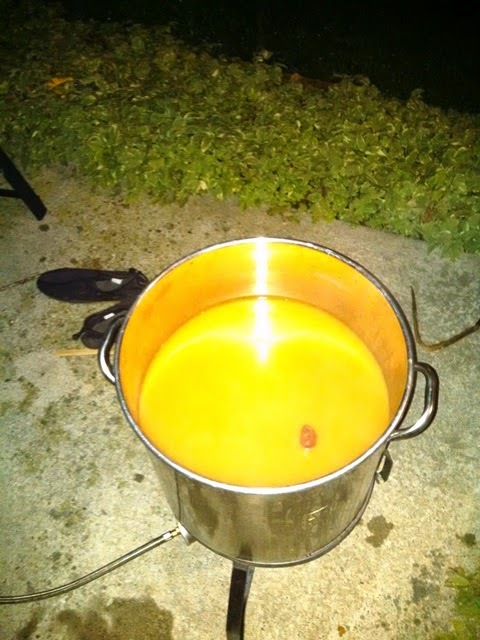 I added the canned pumpkin right into the sparge water. This made the water eerily orange. 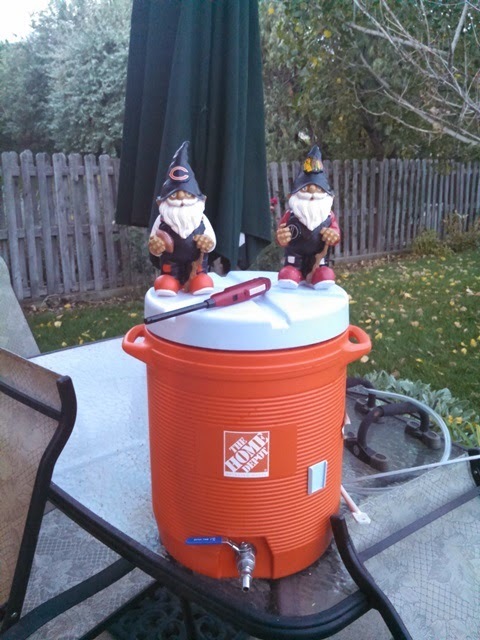 I had decided to use a grain bag in the mash tun in case the pumpkin caused a stuck sparge. 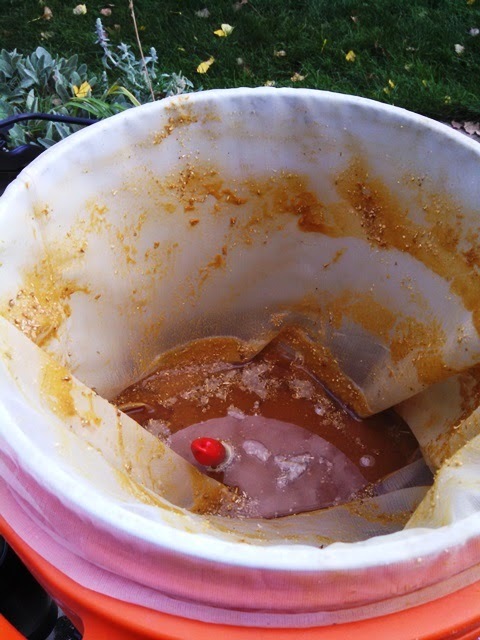 I also did a step-mash with a protein rest which I was also would prevent the sparge from getting stuck. I got the temperature perfect for the protein rest of the step-mash. Right away it was 120, which was exactly what I had planned. The second step didn't go quite so smoothly. My original infusion brought the temperature up to 156ish. Too high. I cooled it quickly with ice down to 140. Too cold. At this point, the mash tun was too full to use hot water to bring up the temperature, so I did a kind-of-sort-of decoction. All I did was scoop out about half a gallon of the grist and water from the top of the tun and boiled it. Then, I added it back into the mash. After doing this twice, the temperature was between 145 and 150. Great. I ended up being very glad that I went with the grain bag, because the flow during the lauter did stop. By lifting the grain bag, I was able to get the flow going again. Eventually I got the right amount of water into the kettle. It was a little low in gravity, though, so I added some DME and some brown sugar to bring the gravity up a bit. 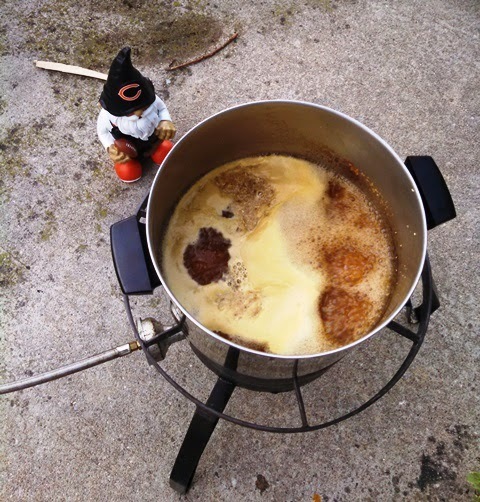 The boil went pretty smoothly, although it got increasingly windy so I had to keep an eye on the flame. The flame never went out, so I guess I didn't really have to watch it. It started to rain as I was emptying into the fermentor. 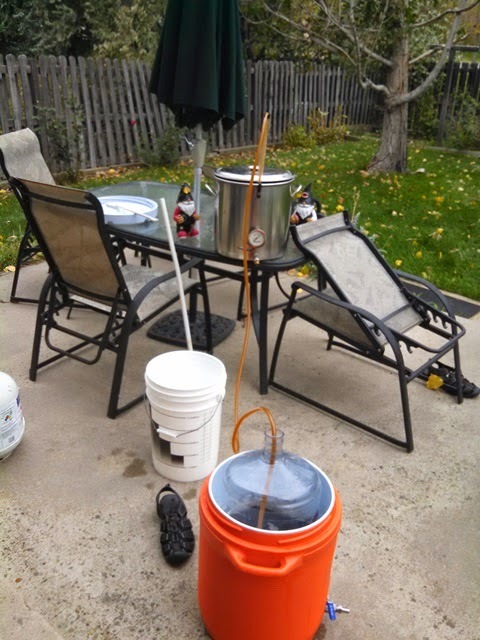 I got the wort transferred before it started raining too hard. I got the wort cooled to about 64F before pitching the starter of yeast. And there was kraussen before bedtime, which is always a great sign. 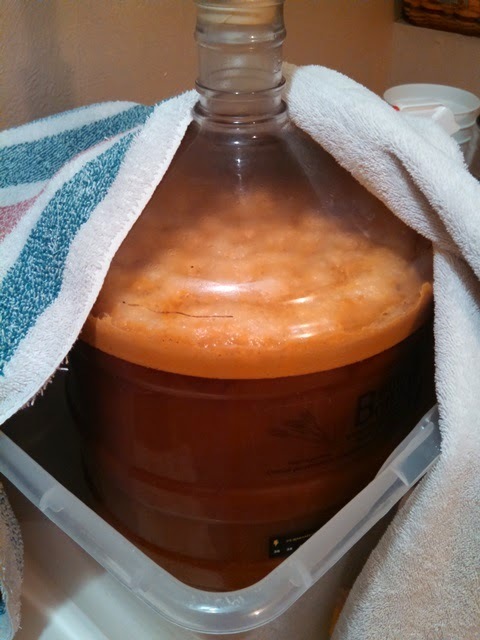 It is fermenting away right now. I can smell Saaz hops from the airlock. 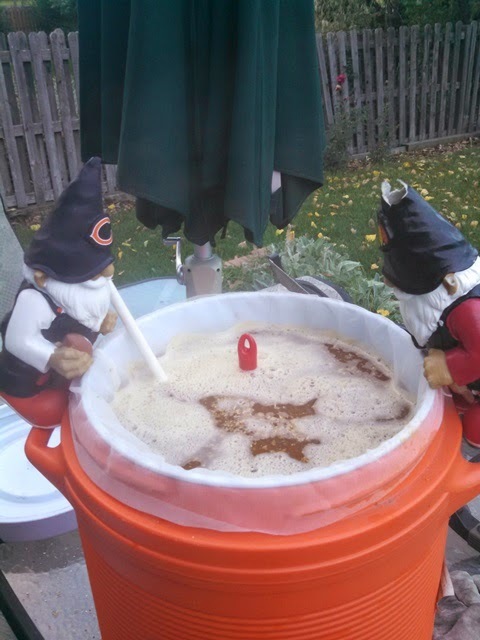 I am thinking this will be another great Seasonal Saison. I've decided that this mashing pumpkin is just not worth it. 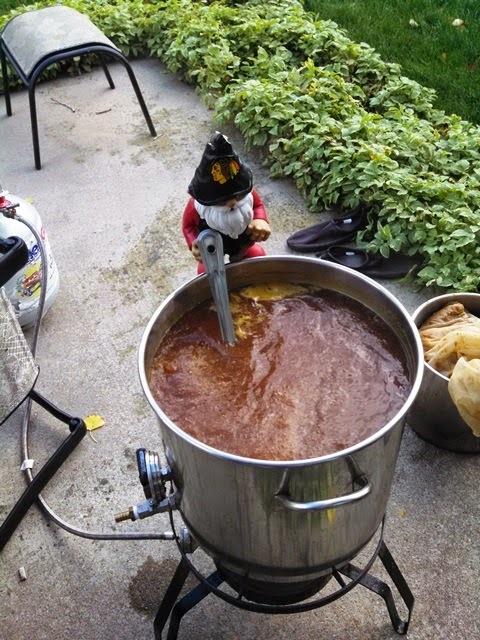 The "decoction" was sort of fun, but I don't think I'll do that "by design" at any point. 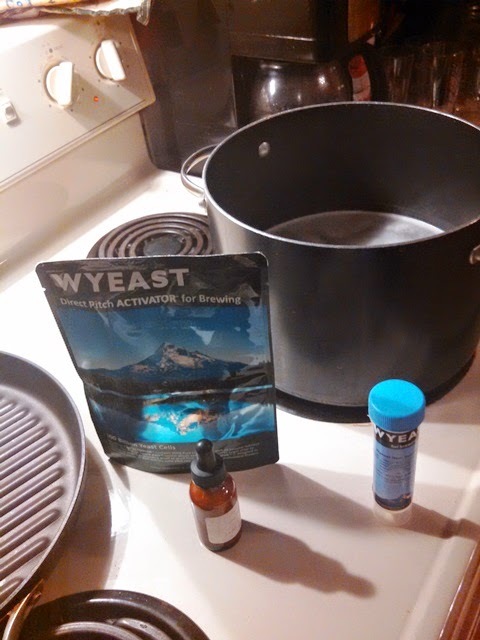 I'm just too old for extra brew-day effort. I should be drinking this beer before nid-November. Should be yummy. Be sure to stay-tuned for updates on this beer. A Saison for every season? I LIKE IT! Cheers! Thanks Allen. Like I mentioned, I'm sure I'm not the first to come up with the idea, because it seems sort of obvious. But I think it pretty cool.